We took advantage of our 3 day weekend by going on 3 birding adventures. One of our trips was to Palmyra Cove Nature Park, but the other days we explored 2 new places: Taylor Wildlife Preserve and Michael Huber Prairie Warbler Preserve. On Saturday night we wanted to go to Amico Island. Every time we go there, we pass a place called Taylor Farm & Wildlife Preserve. People go to Taylor Farm to pick their own fruits and vegetables, but part of the property was turned into a wildlife preserve with a few hiking trails. We’ve been curious about Taylor’s for awhile, so we decided to check it out. We never made it to Amico that night, but had a great time exploring Taylor Wildlife Preserve instead. Taylor’s Wildlife Preserve is right on the Delaware River and Dredge Harbor. It’s a wooded habitat that features stretches of wetlands. We arrived to the sounds of Gray Catbirds and Red-winged Blackbirds. As we walked towards the foot trails we spotted some Northern Cardinals, Eastern Phoebes, and Baltimore Orioles. Yellow Warblers and Warbling Vireos sang from high in the trees while we explored the winding trails. We found the wetlands area not long after entering the trails. There was a beaver lodge, Eastern Kingbirds, swallows, Common Yellowthroats, and Blue-gray Gnatcatchers. “Breep! Breep!” A raucous call came from high in the tree over our heads. It was a Great Crested Flycatcher! These large flycatchers have lemon-colored bellies and long tails, although the crest mentioned in their names are not very prominent. For being about 7 inches in length, the Great Crested Flycatcher has a pretty ear-piercing call. These flycatchers are agile fliers, and we watch it for a bit before it disappeared into the treetops. We also ran into a muskrat on the trail. He didn’t notice us right away, and was pretty surprised when he realized he was being watched. It was a fun moment. Another highlight of our Taylor trip was finding Wright Cove, where there is a platform with an Osprey nest. At the end of April, Dave and I bought a spotting scope and tested it out at the local yacht club where some Osprey nest nearby. We found a second tower with nesting Osprey that night, and wondered if there was a way to see them better from land. It turns out the Wright Cove in Taylor Preserve is exactly where we want to be to see these Osprey really well. We will definitely go back to observe them, as well as explore more the preserve. We woke up early Sunday morning to spend some time at Palmyra Cove. It was a quiet morning so we were able to see 42 species. Some highlights included Cedar Waxwings eating berries, a Green Heron flying through the woods, a Ruby-throated Hummingbird at the honeysuckles, and an Orchard Oriole pair chasing each other around. We ended up seeing some more Great Crested Flycatchers on this trip too. Ever have the experience where once you learn something is around, you start seeing it everywhere? Well it seems like we’ve been missing Great Crested Flycatchers for awhile, because now that we know them, we’ve been seeing them all weekend! Amazing how learning about a species can open up a brand new world you never knew was there before. Today we went to Michael Huber Prairie Warbler Preserve in Woodland Township for the first time. The preserve is 1,227 acres of pitch pine/scrub oak woodlands. An interesting feature of the preserve is a spung. A spung is a hydrologically isolated wetland that relies entirely on rainfall/snowfall to maintain its water level and is habitat to rare plants/amphibians. Our hike started off with some of the usual suspects: Eastern Wood-pewees, Eastern Phoebes, Cedar Waxwings, Eastern Towhees Gray Catbirds, Common Yellowthroats and woodpeckers. But we kept hearing an ascending buzzy sound. It turned out this was the sound of the park’s namesake: the Prairie Warbler. Despite its name, these warblers don’t live on prairies, they prefer scrubby pine forests. This makes Huber Preserve the perfect breeding habitat. We were able to see and hear these beautiful yellow and black warblers throughout the entire walk. At one point on the blue trail Dave heard a low bellowing call. We froze and listened. “Hoo-hoo-hoo-hoo, hoo-hoo-hoo-HOO!” I couldn’t believe it. I could recognize that voice anywhere; it was a Barred Owl! It was in the distance, but we heard it call a few times. I’m so excited that we added our 2nd owl to our lifelist :-). There are actually 2 spungs at the preserve: one on the green trail and the other on the red trail. I really wanted to go to the red trail spung (which was mentioned on their website), but we would have had to walk at least 3 miles (one way that is). You can bike at the preserve, so we will probably go back and bike to that spung. We did try to find the green trail spung, but its seems like it dried up. So no spungs for us today :-(. We did however see a Pine Warbler, more Great Crested Flycatchers, Ovenbirds, an American Redstart juvenile male, Black-and-White Warblers, and the Prairie Warblers/Barred Owl listed above, so it was a great day despite there being no spung. It was a fun weekend of adventures, and overall May was a great birding month for us. Hi friends! Sorry I disappeared for a little bit, but I have a good reason… Dave and I went on a birding vacation! We spent the weekend in Maryland and Delaware hiking and looking for new birds. We had two major stops planned for our day in Maryland. In the afternoon we drove into Baltimore to explore the National Aquarium. It happened to be 90 degrees that day, so it was the perfect escape from the heat. There were some birds in the aquarium: an alcid (auk) exhibit featuring Atlantic Puffins, Black Guillemots, and Razorbills,;and a rainforest exhibit with a variety of birds flying around. But the main highlight of our day was spending the morning at the Pickering Creek Audubon Center in Easton, Maryland. Pickering Creek Audubon Center is a 400-acre park on an undeveloped tributary of the Wye River. In 1981, George Olds and Margaret Strahl, who were brother and sister, donated Heigh-Ho Farm to the Chesapeake Audubon Society. The property later became Pickering Creek Audubon Center. The farmhouse and adjacent builds are still there and the first thing you see when you enter the park. Pickering Creek is hidden in a quiet rural area, and features fresh water wetlands, a meadow, and a mature hardwood forest. In the forest you can visit the house of Gilbert Byron, the American author and poet who lived on the property for 45 years. Our adventure began on the Pond Loop Trail behind the farm. The trail was densely lined with trees and had numerous Wood Duck and Bluebird nest boxes. We were hearing a lot of birds but they were hard to spot through all the leaves. Some of the birds around the pond included Mourning Doves, Common Yellowthroats, Northern Mockingbirds, Gray Catbirds, Eastern Bluebirds, and Indigo Buntings. We moved on to the Wetlands Trail. There are 2 observation decks that overlook a few small pools. The Wetlands Trail is where we saw most of our Wood Duck observations. Pickering Creek had numerous small ponds and plenty of trees/nest boxes, so it was no wonder that we saw at least 18 Wood Ducks (the most we’ve ever seen on a trip). There were even a few chicks swimming around with their mom. Other birds in the wetlands included Tree Swallows, an Osprey, Great Egrets, Great Blue Herons, Mallards, Blue Gray Gnatcatchers, Red-winged Blackbirds, and a Ruby-throated Hummingbird. We even found a raccoon sleeping in a tree with his little ear sticking out :-). From the beginning of the hike we were seeing a bright yellow bird fly around over head. It was very vocal, had dull upperparts, white eyerings, and black on its face. It flew deep into the thickets being loud. We kept trying to get a good look at it, but were continually missing it. It wasn’t until towards the end of the Wetlands Trail when this mystery bird landed at the top of a nearby tree and sang that we got a good look at it. It’s song was quite unusual. It croaked, rattled, gurgled, whistled, and made all sorts of jumbled sounds. We later learn that we were watching a Yellow-breasted Chat. Yellow-breasted Chats are part of the Wood Warbler family, but seems like more of a mix between a warbler and a tanager. It’s the largest warbler, with a longer tail, a heavy bill, and a more varied repertoire of songs. It was fascinating to watch him sing from the treetops. The final trail we took was the Farm to Bay trail, which leads out to part of the creek. Along the way we found Eastern Wood-Pewees, woodpeckers, Blue Jays, Northern Cardinals, Carolina Chickadees, and our first White-eyed Vireo (although we wouldn’t find that out until the next day). Overall we saw 33 species during our walk. We had a really lovely morning exploring Pickering Creek Audubon Center. If you ever happen to be in Eastern Maryland and want a quiet, rural environment, Pickering Creek is the way to go. You can check out their website at pickeringcreek.audubon.org.It was the perfect getaway from the hustle and bustle of everyday life. Stay tuned for Part 2, where I talk about our birding day in Delaware! So far, May has been a pretty busy birding month for us: new life list editions, an owlet, purchasing our first spotting scope, big day events, and rare birds. The past week wasn’t as busy, but we still had the opportunity to get out a few times this week to enjoy the spring migrants. Dave and I went to Strawbridge Lake and Boundary Creek, Dave and his dad went to Palmyra Cove, and I went with my mom and sister to Haddon Lake for Mother’s Day. I wanted to share some of the pictures we took on this week’s trips. We didn’t take any pictures at Boundary Creek because it was supposed to rain and pretty dark out. The highlight of that trip was seeing 5 Baltimore Orioles: 3 males and 2 females. It was fascinating watching the orioles flying around chasing each other, fighting, calling/singing, and displaying. We have a very exciting trip coming up…I can’t wait to share our experiences with you! It’ll be a surprise…stay tuned. We turned onto the gravel road into the woods. It was farther away than I remembered. As we made our way down the road, I was getting excited about what we would experience. The last time I went to Cloverdale Farm in Barnegat was in 2012 with Maria. We went down a dirt road and parked somewhere in a clearing near an old building. There was no visitor center or restrooms because Cloverdale was a newer addition to the county park system. It was a place of undisturbed beauty, and I remember seeing many egrets and swallows there (even though I didn’t know much about birds at the time). Sunday was my first time back at Cloverdale Farm since 2012. This time Dave and I were going to Cloverdale Farm Big Day of Birding. Over the years, Cloverdale has become a popular birding spot. I frequently see birds from this location on the rare bird list, and of course, I checked the list before we went. There were two rare birds listed, a Prothonotary Warble and a Red-headed Woodpecker (we didn’t see either by the end of the day). When we arrived I noticed that it was a little more developed (in a good way), but still retained that natural beauty. Cloverdale Farm Big Day of Birding was an event featuring many South Jersey birding groups. There were presentations throughout the day as well as guided tours by naturalists. Dave and I attended two presentations. Our first presentation was by Allen Jackson of the Purple Martin Conservation Society about the management of Purple Martin housing. We also learned about the NJ Osprey Project with Ben Wurst of the Conserve Wildlife NJ Foundation. Both presentations were interesting an informative. From there it was time to go birding on our own. Outside the visitor center we spotted a female and male Eastern Towhee, a Blue Grosbeak, Chipping Sparrows, American Goldfinches, Carolina Chickadees, House Finches, Eastern Bluebirds, and an Indigo Bunting. A Great Egret waded through a nearby pond while Tree Swallows, Barn Swallows, and Red-wing Blackbirds flew in all directions. A tiny, streaky shorebird flew by and landed near the pond’s edge. It rapidly pumped its tail while probing the mud. It had a yellow legs, a yellow bill with a black tip, and a pronounced white eyering. It was our first Spotted Sandpiper! Cloverdale Farm has actually been a working cranberry farm since the early 1900s. The New Jersey Pine Barrens have been a top producer of cranberries since the 1800s, (cranberries for Ocean Spray are harvested in nearby Chatsworth). Now that it’s spring, the bogs at Cloverdale have been drained, but the trail leads around the bogs and a reservoir into the woods. We saw Blue-gray Gnatcatchers, more Chipping Sparrows, various Woodpeckers, Tufted Titmice, and Gray Catbirds along the trail. We arrived back at the visitor center to check the ponds again. We were watching a female Red-winged Blackbird when suddenly something dark popped out of the grass. A Little Blue Heron! It flew overhead to the adjacent pond to forage near the Great Egret (which the egret was not too thrilled about). We watched it wade around a bit before it took off again over our heads into the distance. Little Blue Herons are about 22 inches tall (as compared to its larger cousin, the Great Blue, who is around 38 inches) and a dark, purplish blue. The heron we saw was an adult. How could we tell? Juvenile Little Blue Herons are actually white. Being a “white” blue heron can have an advantage when it comes to feeding. Immature Little Blues look very similar to Snowy Egrets. Snowy Egrets are more tolerable when it comes to these immature birds than to the blue adults. This white “disguise” allows young Little Blues to forage closer to Snowy Egrets. With the help of the Snowy, the Little Blue is able to catch more fish. Immature Little Blues start gaining their adult plumage after a year. As they molt and the new plumage grows in they get a “patchy” white-and-blue look, which is usually described as “calico” or “pied”. Cloverdale Farm Big Day of Birding was a fun and informative event. I’m glad Dave and I made the trip to this birding hotspot. We definitely plan on going back to Cloverdale Farm for more birding adventures. On the last day of April, my friend Casey and I took a trip to Longwood Gardens. We went to Longwood Gardens in November to enjoy the fall exhibit, and had so much fun that we wanted to check out the spring exhibit too. The spring exhibit is Spring Blooms and features lovely Azaleas, Rhododendron, Japanese Wisteria, Hydrangea, Fan Columbine, and over 240,000 tulips. The primary purpose of our trip wasn’t birding, but you know me, I’m birding 24/7 (whether I choose to or not haha!). There were a lot of Gray Catbirds, American Robins, Mourning Doves, Canada Geese, Song Sparrows, and Northern Cardinals. In the meadow area we watched a variety of Swallows (Northern Rough-winged, Barn, and Tree) and Red-winged Blackbirds. While walking through the forest habitat we listened to the songs and calls of Hermit Thrushes, Wood Thrushes, Carolina Wrens, and Carolina Chickadees. There are also Purple Martin houses near the rose garden. I didn’t really take pictures of birds during this trip because I was using my smaller lens, but I did take a lot of flower and landscape pictures. I wanted to share with you my favorite spring blooms. I’m not sure what all these flowers are called, but I’d like to, so if you’re good at identifying flowers let me know. It was a cool, breezy evening on Friday. Dave and I were exploring Boundary Creek to see if any new spring migrants arrived. A flute-like sound came from one of the nearby trees. 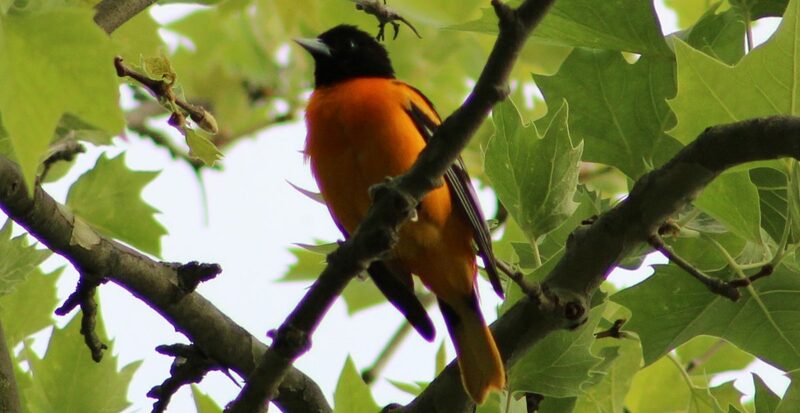 It was a Baltimore Oriole, a first of season for us. We made our way to the Beaver Pond platform to see who else was around. It may not be a spring migrant, but there was something new at the Beaver Pond: Mute Swans. Of all the years walking at Boundary, this was the first time we’ve seen Mute Swans there. A lot of times Dave and I are on the platform alone, but there were some other birders around who we chatted with for a while. Interestingly, they’ve never see Mute Swans at Boundary either.The swans spent some time preening and swimming around the beaver lodge. A few mammals made a special appearance: 2 beavers and a muskrat. The beaver’s lodge (where they live), is not far from the platform, so many visitors arrive at night to see if they can spot them. It was my lucky night: I finally was able to get some nice pictures of one of them. The muskrat also showed up at one point. It’s likely that the muskrat lives in the beaver lodge too. Many people don’t realize that other smaller creatures usually end up living in the beaver lodge, and the beavers don’t really seem to mind (to learn more about that, check out “Leave It To Beavers”, from the PBS series “Nature”). A woman who I was talking to for a bit asked if we ever bird at Palmyra. I told her that we do, and she asked if we saw the owlets yet. I did hear that there were 2 owlets that live there, but didn’t know where to find them. She was happy to tell us the location, so from that point I knew what our Saturday goal was: to find some owlets. Dave and I would be considered “night owls”, so we do a lot of late afternoon/evening or mid-morning birding. But I knew it was important to try to find the owlets in the morning, so we took one of our first early morning bird trips (well…early for us at least lol). On the Perimeter Trail is a newer nest box. The woman told us that the owlets didn’t nest in that box, but in a nearby tree. We knew the location, so we quickly made our way out to the nest box. When we arrived we noticed that the box tree had a message spray painted onto it: “there are two of them”. We knew we had to be close. As we scanned the trees, a group of birders arrived. One of them asked how our morning was and we shared some interesting sightings. Then he said “oh, they must be looking at the owlet” and pointed to another group looking in the tree. They invited us over and there it was! We’ve never really gone birding in a group before, but it was fun to enjoy the sighting with other birders. I’m glad they spotted that owlet! The owlet was older sitting in a far branch looking away from us (of course!). We spent some time watching it preen and stretch its wings. We didn’t see the second owlet, but it probably wasn’t too far away. This was our our 6th Great Horned Owl sighting, but our first owlet. What a wonderful experience! (To read about previous owl sighting check the previous link or this one for 2 separate stories). We continued along the Perimeter Trail with a few other birders. I was really enjoying walking with them because I learned so much. They even helped us find some new life birds! We saw our first Swamp Sparrow and first Yellow-billed Cuckoo. Other birds we observed were Black-and-White Warblers, Indigo Buntings, Northern Waterthrushes, Gray Catbirds (my favorites are finally back!! ), Eastern Towhees, Yellow Warblers, Warbling Vireos, a variety of Swallows, and some Yellow-rumped Warblers. I enjoyed walking with other birders, and hope to do more group birding in the future. Last week was a really exciting birding week for us: a record day at Edwin B. Forsythe (53 species + a rare Black-headed Gull), seeing our first owlet, and 7 new life birds (5 at Forsythe, 2 at Palmyra). We also purchased our first spotting scope! We bought a Celestron Trail20-60×80 angled scope. We tested it on Thursday near the one of the yacht clubs on the Delaware River and found 2 Osprey nests! We have a few exciting birding trips coming up later this month that I can’t wait to share with you! Author BirdNationPosted on May 3, 2017 May 4, 2017 Categories Birding Trips, Birds, Tales from the Field, UncategorizedTags baltimore oriole, beauty, Boundary Creek, environment, great horned owlet, great-horned owl, migration, mute swan, nature, owlet, Palmyra Cove Nature Park, parks, spring, wildlife5 Comments on Owlet!